Every few kilometers a completely different landscape! 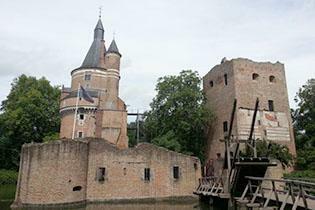 This long cycle tour has it all: heath, woodland, farmland, rivers, canals, hills, polders, country estates, castles, churches, windmills, farms, bunkers, trenches and more. In the first part of our tour we cycle through heath, woodland and farmland to the lovely historic town Wijk bij Duurstede. We pass through Den Treek and Sandenburg country estates. At Wijk bij Duurstede the river Rijn (Rhine) branches into the Lek and the Kromme Rijn (Crooked Rhine). A gravel cycle path takes us around Duurstede Castle, a beautiful ruin used as a site for weddings and special occasions. Wijk bij Duurstede is a compact historic town. The Big Church (formerly Saint John's Church) has a flat rooftop tower. Money ran out and there wasn't enough to make the tower higher and erect a spire. 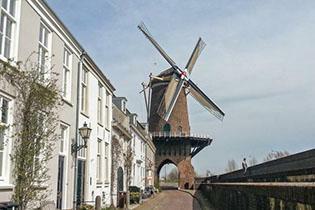 The fantastic windmill on the bank of the river dates from the 17th century. It is the only drive-through windmill in the world and a great place for taking holiday photographs! 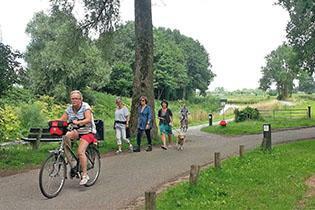 We cycle on top of the river dike along the Rhine to Amerongen. Amerongen is a small picturesque village with cobbled streets which also has a beautiful castle (Kasteel Amerongen ), windmill and church. 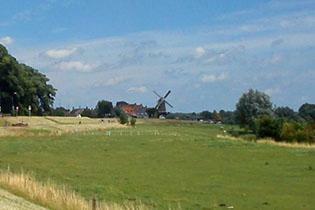 Leaving Amerongen behind, we cycle across the Amerongse Berg - at only 68m the highest point in the Utrecht Provence. The last part takes us along the Valleikanaal (Valley Canal) back to Amersfoort. The Valleikanaal was part of the Grebbelinie an 18th century defence system against foreign armies based on flooding large parts of the country. In 1939 the Grebbe line was once again fortified against a German attack on the Netherlands. In recent years the defence works have been reconstructed to make them more visible.